Check out our Flax Frequently Asked Questions. Is Your Flaxseed -Gluten Free, Nut Free, Lactose Free, Kosher? How Much Flax seed Should I Take Daily? Is Flaxseed Safe for Kids and Toddlers? Is Flax Beneficial for My Pet? How Do You Eat Flax Seed? Can I Substitute Flax for Eggs and Oil or Cook with it? Do You Need to Grind the Whole Flax Seeds? I Like the Crunchiness! I Don't Have Time To Grind, Is Cold Milled Flax The Same? Is the Flax Meal at the Grocery Store the Same as Cold Milled Ground Flax? I am Vegetarian. I Heard I Should be Eating Flax, Why? There is Golden, Brown, Red and Yellow Flax -What is Going on? I use Flax Oil. Should I also Eat Flaxseed? I Have Diabetes -Should I Eat Flax -How much? A: Flax seed has actually been used for thousands of years all over the world because of it's powerful health benefits. Flax is a seed that is also considered a whole grain. Flax seed is a powerhouse for healthy eating as well as for disease prevention. Flax seed contains Omega 3 Fatty acids, Fiber -soluble, insoluble and mucilage fiber, Protein (esp good for vegetarians), Lignans (powerful for anti-inflammation and anti-oxidants), vitamins, minerals and amino acids. Research has been done with flaxseed showing that the flax benefits are extensive including prevention of heart disease, prevention of certain cancers -including breast cancer, lowering cholesterol, preventing inflammatory disorders, prevention and help with diabetes, among many other flax health benefits. Q: Is Your Flaxseed -Gluten Free, Nut Free, Lactose Free, Kosher? Is it NOT Genetically Modified? Our Flax is Gluten Free and processed in a Gluten, Nut + Lactose Free Facility. It is also Kosher. Our Flax is NOT Genetically Modified -Non GMO. This is a very important question as Celiac's and other types of Gluten Free diets are being followed. It is very important for people who need to eat a Gluten free or other Allergen Free diet to know where their food, specifically where their flaxseed is coming from. More and more flax and other foods are coming from many other countries where standards can be very different -additionally the flax must be shipped and stored longer. Our Flaxseed is NOT genetically modified. You will get the highest nutrional value from this Omega 3 Golden Flax seed. It is always better to eat local foods -not only do you support the farmers, but you will get better nutrition! Have you watched the Future of Food Documentary? It is excellent! Q: How Much Flax Seed Should I Take Daily? A: We recommend 2-4 Tablespoons of ground flaxseed per day. When you start eating flax, start with 1 Tablespoon per day due to the extra fiber. Read more details about how much flaxseed to eat daily -for adults, children, and those with digestive system sensitivities. Did you know pets need Omega 3 also? Read more about how much omega 3 flax seed for your pets. Q. Is Flaxseed Safe for Kids and Toddlers? Flax is a natural plant source of Omega 3, which is important for brain development in children. Flax is also high in fiber and even children are not getting enough fiber in their diet causing constipation or a slow moving digestive system. Flaxseed has vital nutrition and is considered safe for healthy people of all age groups. To Read our recommendations for how much flaxseed for kids here. Q: Is Flax Beneficial for My Pet? Q: Does Flaxseed Help Constipation? A: Yes, flax seed is very beneficial for helping people suffering from constipation -or even diarrhea! Flaxseed helps relieve constipation with it's Omega 3 oils as well as the healing and soothing flax mucilage fiber. It is important to drink water after eating flaxseed because flaxseed will bulk up and absorb liquid. Flaxseed helps with chronic diarrhea, IBS and other digestive irritations by helping to gently bulk up the stool. If you mix cold milled flax with water, you will see it bulks up and thickens up the water -this is what it does through the digestive system. The flax mucilage fiber gently cleanses and heals the irritated intestinal tract. Flaxseed fiber will help cleanse the colon and continued usage can help avoid colon cancer. Q. How Do You Eat Flax? A. There are many ways to eat flax seed -remember it is a food, so whatever ways taste good to you is perfect! We have many ideas of how to eat flax seed here, including in yogurt, applesauce, juice, smoothies, protein shakes, salads, etc. We also have many flax recipes. Q. Can I Substitute Flax for Eggs and Oil or Cook with it? A. Yes you can. In fact, Vegans use flaxseed to substitute for eggs -since they don't eat eggs. Read how you can substitute flax seed in cooking and baking here. You can also cook with ground flaxseed read more about cooking flax seed and baking flax. You can try these delicious Flax Recipes. When you cook with flax, it will usually make baked goods slightly chewier with a slight decrease in volume due to the extra Oil and Fiber of flax. Q. Do You Need to Grind the Whole Flax Seeds? I Like the Crunchiness! A. I totally understand, because I like that crunch as well! In order to get all the benefits of the small seed, you DO have to grind it up otherwise it is basically "Seed In, Seed Out" and that is simply expensive roughage! Whole Flaxseed has a hard hull that makes it difficult for the digestive system to break down. When you grind flax, it releases the nutrients from the flax. ...Inside the small flaxseeds are all the nutrients: Omega 3 essential oils, the fibers, protein, vitamins, minerals, etc... and in the hull of the seed are the lignans. All these parts need to be ground enough so the body can break them apart and utilize the benefits! If you really want the crunch AND the health benefits... do what I do: mix some whole seeds AND the ground cold milled flax seed to your favorite foods! ...Then you get both! Q. I Don't Have Time To Grind, Is Cold Milled Flax The Same? A. You are not alone... most people don't have time to grind. The Cold Milled Flakes of Gold that we have are freshly ground flaxseed. What makes cold milled flax so great is that it has never been exposed to heat in the grinding process. The Omega 3 oils are fragile oils and can easily denature, break down and go rancid if/when they are exposed to heat. The reason we buy and use cold pressed olive oil is because of the Omega 3 oils. We aren't getting enough Omega 3 oil because so much of what we eat is cooked, baked, fried, and processed. So, the Omega 3 is lost in those processes. The flax was milled by the family farmer using a proprietary method he developed to protect the Omega 3 oils. Read more about this Cold Milled Flax seed. And as always... use your taste test: Does it taste good, smell good and not have a bitter aftertaste? If it does, then it means it is rancid and it is like eating rotting flaxseed. We have the highest quality Flaxseed and have received raving reviews about our Cold Milled Flax seed -Flakes of Gold. Q. Is the Flax Meal at the Grocery Store the Same as Cold Milled Ground Flax? A. No, it is not. According to those in the flax industry, flax meal has been ground removing most of the Omega 3 oil. This would make it easier to ship and store the flaxseed for longer on the shelves. This is likely done to use flax meal as more of a flour replacement -and to provide a way to sell the flax meal after the Omega 3 Flax Oil has been taken out to sell at a higher price. Most flax meal is used in animal feed. Check the package label and compare the nutrient composition --and we ALWAYS recommend that you use the highly effective quality of flax test: Does it taste good, smell good and NOT have a bitter aftertaste. We highly recommend buying flax in only 2 ways: 1) whole seed and grind yourself -OR- 2) Cold Milled ground flax seed. Q. There is Golden, Brown, Red and Yellow Flax -What is Going on? A. It does get confusing... but just like every plant, ie tomatoes -there are many different types! 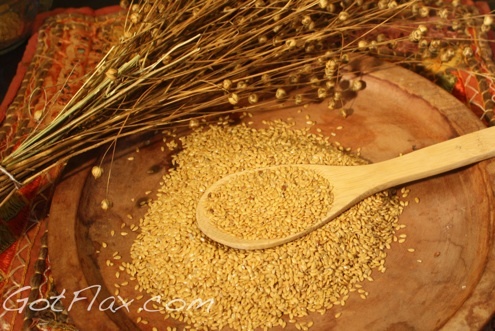 You can read all about the types of flax and golden vs brown flax seed. Brown flax seed (also called Linseed) is primarily used for animal feed as well as commercial oil, paint and solvents. In a nutshell, Golden Omega 3 Flax has higher Omega 3 content and is easier to get all the health benefits from the flaxseed. It tastes delicious as well! You want your golden Omega 3 flax to be plump, shiny and have a light nutty taste. Q. I Have Diabetes -Should I Eat Flax -How much? A. Yes -Our customers with Diabetes have eaten flax and loved it, in fact, we have stories from some of them how they were able to lower their A1C as well as stabilize peaks and valleys of blood sugar levels. The reason it is so good for diabetics is because it is a Low Glycemic Food, which helps keep the blood sugar from spiking for longer periods of time. For this reason, we recommend eating 1-2 Tablespoons of flax in the morning and 1-2 at night. Or if you are having a lot of spikes, eat 1 Tablespoon 3-4 times per day. Read more about the benefits of flax for diabetics and how much flaxseed per day. NOTE: Information presented here does not replace seeking advice from your physician. Back to Home from flax information, flaxseed information, flax seed faq, flax frequently asked questions.